With Neeson at the helm of The Commuter, there is no doubt it is an edge of your seat thriller that will keep you involved and engaged for the most part until the very end. Have you ever commuted on a train back and forth to work every day? Have you ever watched your fellow commuters as you did? It is a fascinating study of human nature and one that writers Byron Willinger and Philip de Blasi decided would make for a great script. As they saw the same people all the time on their commute in the northeast they thought "what if we turn this into an Alfred Hitchcock/Agatha Christy murder mystery?". This became the basis for a fascinating thriller called The Commuter. Michael MacCauley (Liam Neeson; Taken) commutes to his job as life insurance salesman in the city every day. It is boring and routine until one day it isn't. MacCauley, an ex-cop, finds himself laid off and wondering how he is going to afford his son's college tuition when on the way home he is approached by "Joanna" (Vera Farmiga; Bates Motel). What starts off as a casual conversation suddenly becomes a game of cat and mouse with MacCauley caught in the middle, admittedly by his own making. As he races against the clock, he must unravel the clues to find out who the killer is and why they want someone on the train dead. Liam Neeson is one of those rare and hard to find actors. For years now, he has been able to pull off comedic, dramatic, and action roles that look extremely believable and does it with ease. The Commuter is no exception as he tries help solve the mystery of the train as well as save lives. Neeson fully embodies the character he portrays and you actually believe that he is Michael MacCauley. Farmiga plays the cold and calculating Joanna with such poise you think she was talking about taking a stroll in the park and not contemplating murder. The rest of the cast holds their own very well including Neeson's old-time partner Alex Murphy (Patrick Wilson; The Conjuring) and Captain Hawthorne (Sam Neill; Jurassic Park). Probably one of the most interesting aspects of the cast is that 90% of them are from the United Kingdom (and not from New York City as their accents would have you assume) as the entire film was shot in Pinewood Studios in London. The 2160p HEVC H.265 conversion looks simply amazing. Starting with a 4k DI negative, the film's color depth and attention to detail are mind-blowing. The only negative to be seen was that the digital grain added to the master was more proliferated. The Dolby Atmos track is packed full and really accentuates the background noises. The dialogue is front and center while the sounds of the train and gunshots envelop the viewers from all sides and angles. Special Features — ported from the Blu-ray - include: End of the Line —containing behind the scenes footage, interview, and clips from the film, a second feature entitled Off the Rails which offers a look at what it was like to shoot in tight corridors, and of course the Digital HD copy of the film. The extras offer some unique insight and are enjoyable for the most part. While the plot is interesting and definitely character driven, there are moments where the story lags making the movie somewhat unnecessarily drawn out. However, with Neeson at the helm of this feature, there is no doubt it is an edge of your seat thriller that will keep you involved and engaged for the most part, until the very end. Neeson does what he does best here and if you are a fan you will certainly not regret spending almost two hours on this train. 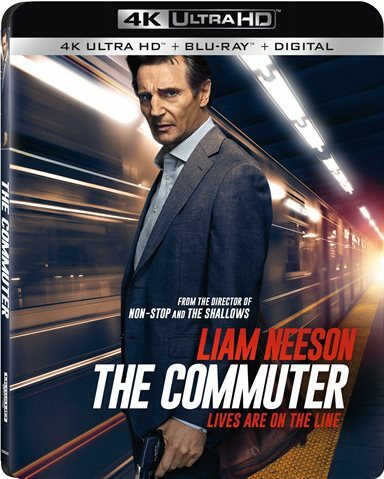 Download The Commuter from the iTunes Store in Digial HD. For more information about The Commuter visit the FlickDirect Movie Database.